Join us for a ladies night filled with fun, laughter and friendships. Registration includes pasta dinner, pallet and supplies. Please bring a dessert. The Sisterhood Ladies Ministry is hosting an online Bible study of Havilah Cunnington’s Eat, Pray, Love Study. This course is designed to last 20 days and is online. You will need access to an email account and Facebook. Summer is quickly approaching. 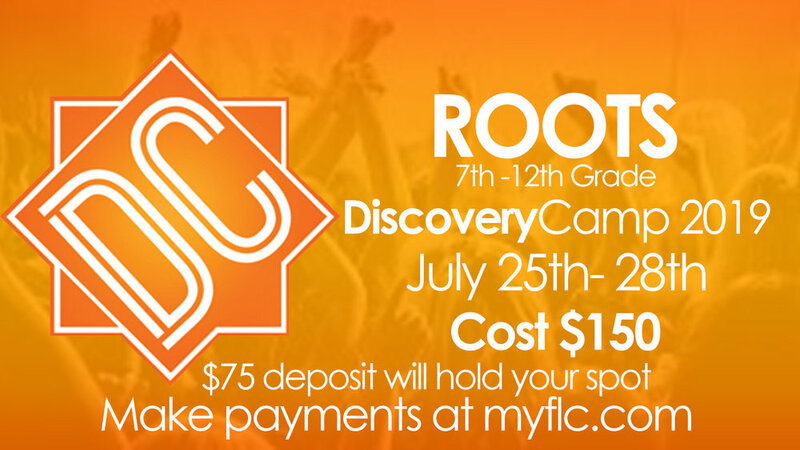 Be sure to sign your teenager up for Roots Discovery Camp. If you have a 6th grader going into 7th they can sign up as well! Here at FLC we believe in the healing power of God and in families. Join the entire FLC family as we pause all over the community to partake in communion together. We do this at 6 PM. You can pick up your communion elements in the FLC foyer with instructions. Don’t miss the annual FLC Egg Hunt. Bring a picnic lunch for after the 11am service. The egg hunt begins at 2pm. Hunts are available from birth to adult. Prize eggs with $500, $50 and many other prizes. Sunday, April 14th is a special family service for all of our FLC family. Invite your loved ones, neighbors, kids and grandkids to enjoy the day together. Family Blitz will be at both the 9 AM and 11 AM services. Purchase Easter lilies in Honor of or In Memory of a loved one. Cost is $14 per Lily. Ladies, grab your gal pals and make plans to attend an incredible Girls Night Out! A spectacular presentation of A Million Dreams, a vision board party, scrumptious food and girl bonding time! Join us at Family Life Church on Saturday, March 30th, doors opening at 6: 00 PM for a coffee meet and greet. Service begins at 6:30pm. Vision boards, cake and coffee immediately following. Childcare provided.. Registration is now closed. Please register at the door the day of event. All FLC volunteers are invited for a free meal and training. Super Bowl party located at Family Life Church in the Roots Room. Invite your friends for a night of fun, laughter, prizes and food! Join iKiDs for games, snacks and tons of Christmas fun! You don’t want to miss this! Wear your PJ’s for all ages. Join us for this very special service as we give thanks to the Lord for all He has done for us. This service is designed for the entire family. Trunk or Treat is an alternative to Halloween. Kids can attend as something good God created. Carnival rides, games and candy are just a few of the night’s attractions. The best decorated trunk wins a $1000 jackpot! Bring candy to donate on any Sunday in October. Sign up today to volunteer or decorate a trunk. Joe presents some of the most entertaining, yet practical teaching on the family available today. His laugh-and-learn approach removes every barrier and provides listeners with a new hope for stronger families and a deeper commitment to obey the Word of God in their lives.